First work day of 2015. Off to a great start uploading auditions and working on a SAG commercial for Universal Studios. Who said union theme park commercials were a thing of the past? I dealt with a difficult situation over the holidays with a commercial renewal. It felt great to fight for the talent and have the client apologize to me. That was a first! Notes like this encourage me to continue in the business, “Thank you very much for fighting for me on this. After having so many agents in my life that have been wishy-washy and acted like they didn’t care, it’s so refreshing to be represented by someone who is willing to put her clients first”…Jim Sorensen. 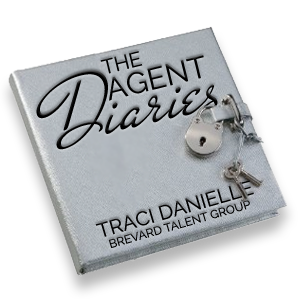 Note from Traci: Too bad the other agents accepted the client’s offer and did not try to negotiate for more money. I have a million things to catch up on…it never ends. It is a great day for Florida! Marriage is legal for gay citizens. Today is dedicated to Joel Binford the former Screen Actors Guild Central Florida representative who passed away many years ago. Before Joel died I had the privilege to attend his commitment ceremony to his partner Jerry. I wish Joel would have been alive today to celebrate this historic day. It has been a long day at the office. I am leaving to go home and eat dinner…it is 8:15. My boyfriend called to tell me a bear ate a banana tree in my yard. If it is not one thing it’s another! Happy Birthday to me! I am not sure how the word got out but, I have been blessed to have so many people remember my birthday. 54 going on 24…if I only knew then what I know now! Commercial season is picking up. Found out two of my actresses are pregnant. One of them told me, the other did not until I called for an audition. Note to all actors – let your agent know you if your appearance changes. On another note…it puzzles me that actors do not return phone calls promptly for commercial auditions and when they do the slots are gone. Don’t miss an opportunity because you do not check your messages. Slots are limited on commercials…the early bird gets the worm! Happy Birthday to Elvis! Elvis would have been 80 years old today. Hard to believe he died at 42. I was a teenager working at my first job at Long John Silver’s when my Granny and Aunt Sandra came in and told me Elvis was gone. My mom met Elvis in the 1950’s in Atlanta. He was interested in her…she was not…who knows, maybe my name would have been Lisa Marie and not Traci Lynn. I submitted an actor on a TV project only to find out he is in a play. It would have been nice knowing this information before I wasted my time as well as the casting director’s time. If you decide to be in a play let your agent know, as well as the performance dates in case they want to attend. IT IS TAX TIME…joy…joy…working late to send out 1099s as soon as possible. The commercial season is in full gear. I am submitting on numerous commercials for SAG extras. Only 1 out of 4 projects is casting for principals in this market. Frustrating to say the least. I called Richard Regan Paul who is working on his first big feature film “Geostorm” in New Orleans. I wanted to check in to see how the shoot is going and if he received his per diem. Richard told me “I am having so much fun. I am indebted to you. Thank you for blessing my life (sic) all of the opportunities with you”. That made my day! I am so happy when my actors are working. One of the best part of my job is to call an actor and let them know they booked the job. Sure beats “Traci’s Drama Therapy” session when they are on a dry streak. 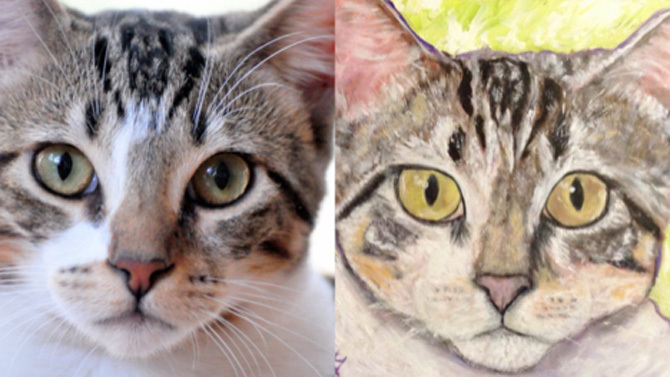 Look at my adorable Molly and her portrait. I love her so much! Spent yesterday working on taxes and preparing 1099s to send out. At least I could watch football and work. Pilot season is fast approaching. I feel like this is the calm before the storm hits. I booked SAG extras on a shoot for Universal Studios. I am glad my SAG actors are able to make money which goes towards insurance and retirement…and you can’t get upgraded if you are not on set. Yes, upgrades happen. An actor’s life is like a roller coaster. Sometimes you are on a booking streak…sometimes you aren’t. I received this email today: “It’s almost a year since I got a job from an audition, 50+ auditions. There’s something wrong with what I’m doing or how I look, or both, and it’s getting to me”. Then the actor asked if he could call casting to see what he is doing wrong and how he can improve. My answer was NO…never let a casting director know you are doubt yourself. I am not sure how to answer this question except to say keep the faith, believe in yourself and 50 auditions is better than no auditions. I need to plan a trip to Atlanta to visit with casting directors. That is one of my goals this year. Even agents have goals. What are your goals for 2015? One of my actors was recently diagnosed with cancer. It made me feel good to know casting and production are working to arrange the schedule in order to work around the actor’s medical appointments. Your life can change at a moment’s notice and then this business is not as important as you thought it was. Surviving is! I put two actors on a “NO Procrastination Diet”. I hope they make it through the year. Today is slow which is giving me time to catch up and assist actors in picking out new headshots. I finally am catching up from the holidays. 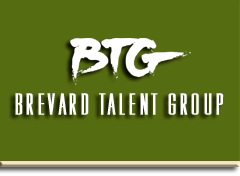 Submitted on “The Trap”, a film shooting in Miami, starring Jamie Foxx. Casting requested current resumes. I know a lot of the resumes I have on file are not current…but it is not my job to request your resume. Every time you work in film/tv you should update your actors access account and email your agent an updated resume. The business is too fast-paced to wait for any actor to not be proactive in their career. Lori Wyman is casting for the new HBO show “Ballers”. I gave an actress the opportunity to audition. This is a reason NOBODY should self tape unless they know what they are doing. Note from the actor: “I knew there’d be someone to watch it before it went through who would let me know if it was just too poorly done to pass on. I could provide a list of things that went wrong (as they tend to do), I’ve realized, without a doubt, paying for it to be done is best. Recording from home went so well in the past, it just did not this time”. Actors you get one shot…you need to do your best. I recommend taping services for this reason. This opportunity was blown by poor planning and execution. TGIF…the complaint department is closed today! I am heading to Tampa to see the play “Two Rooms” at Performer Studio Workshop. Looking forward to seeing Breann Couch, Carrie Drasek, Zack Gossett & Lance Tafelski…directed by Ricky Wayne. I love when my actors do theater as long as there is # 1 an understudy, # 2 it is not during the busy season and # 3 that you book out when you are not available. I am happy that technology allows me to work anywhere as long as internet is available. Thank goodness no more casting notices by fax! “Young Performer of the Week” goes to Owen Teague and his parents Gail & Greg. Owen had a callback in Atlanta for “Halt & Catch Fire” and a callback for a film in New Orleans, on top of finals, recording ADR for “Bloodline” and opening a show at the Asolo Theater in Sarasota! I have no doubt Owen will be successful in whatever he chooses to do in life with that kind of dedication and support. Special thank you to all parents of young performers who help make their child’s dreams come true. It Martin Luther King holiday. The office is slow. I am ok with that. I can’t stress how important communication is. Last week, I sent out an audition. For every film/tv audition I send out, I request the actor to reply accept or decline. Is that too difficult? I did not receive a response from one of the actors. An hour before the deadline, I sent a text asking if he was going to send an audition; the reply was no. I asked why not and was told no time. Another opportunity lost. I understand actors cannot accept every audition but please let your agent know. Agents have to notify casting as to the reason why the actor did not submit an audition. If you need an extension ask. On another note: This is a great way for an actor to communicate. I received an email from Greg Nappo: “Traci. I just wanted to take a moment and say thanks. With every new year I tend to reflect on the past and the things I want. For as long as I can remember, all I ever wanted is to be a working actor. With you as my agent, I know it’s possible. Thanks for your guidance”. It was a positive way for an actor to say “Don’t forget me…I am alive and ready to work”. I am grateful that actors have cell phones…especially when they have a 5:00 AM call time and production needs to find them. Thank goodness the days are gone that production pages me and I have to page the actor who has to find a pay phone to find out where they are. Richard Regan Paul called me to let me know he wrapped working on “Geostorm” and had the time of his life. I wish all actors would check in after a booking either by email or a phone call. For all principal bookings you should check in and update your agent on the shoot and any issues that need to be dealt with before the production office closes. 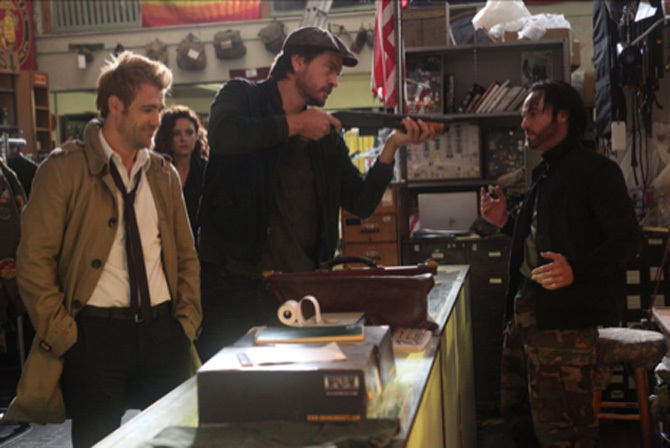 I was on the NBC website to verify that Roger Floyd’s episode on “Constantine” was airing as scheduled when I found this picture. You never know where “BTG” actors will show up! The day started canceling tattooed actors who had a print audition for Anheuser-Busch. When you decide to make a permanent decision regarding your body, it can affect opportunities in your future. Just sayin’. Happy Monday…it is a new week with new opportunities for actors! One of my young performers has been invited to a work session in Los Angeles for the Nickelodeon pilot “Future Shock”. I think his mom was in shock when I told her the news. Hopefully, the work session will turn into a test option. Either way this will be a great experience for the family. I went to see the movie “Selma” on Saturday. In my opinion, David Oyelowo was robbed from an academy award nomination. One person can make a difference in this world…whether it is you or Martin Luther King. I received a call from Los Angeles casting director Debra Zane. She requested Bill Kelly to audition for a film she is casting in Louisiana. Debra was LA casting on the Netflix show “Bloodline” that shot in Key Largo and thought Bill would be good for a role. You never know when one job will turn into another. I can’t tell you how many times actors want to “wait” for a larger role and that role never comes along. Glad Bill didn’t wait for a larger role on “Bloodline” since one episode turned into working on four episodes AND the opportunity for another audition with a LA casting director. It is interesting how bad weather in the northeast affects our business. Our commercial season depends on good weather in Florida. Breakdown Service closed this week for the snowstorm. I am glad we don’t have to deal with that! Actors are filming today on the low budget film “Turtle Tale”. I must admit, I am surprised that the director/producer/writer Luc Campeau got this film done with a limited budget. Luc should be an inspiration to everyone. 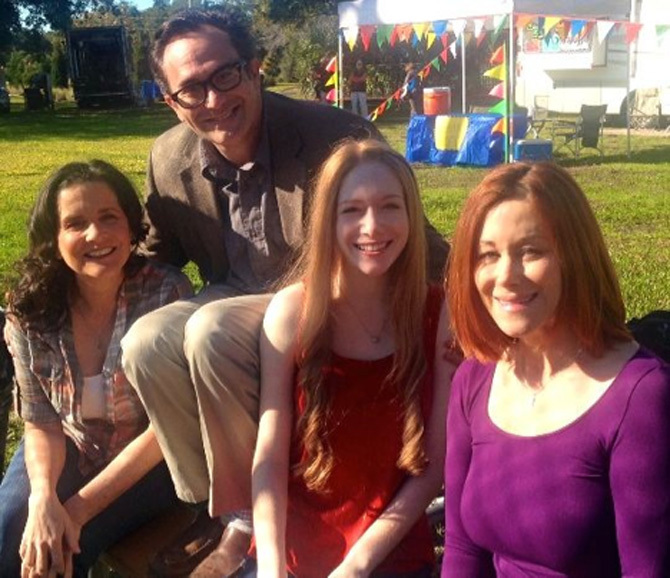 Pictured on set is Mary Rachel Dudley, Ricky Wayne, Lily Cardone & Carrie Drasek. The month is almost over…where did it go? Actors and agents are gearing up for pilot season. What class or workshop have you taken to work on your craft? I cannot stress how important it is for actors to study. I will quote casting director Kathy Laughlin “Acting is an acquired skill…the more you do the better you get”. Olympic athletes train year round. Actors should do the same. Most don’t due to one excuse after another. I could write a book on the excuses I have heard. I want to share this note from Feldstein/Paris Casting. For the most part everyone follows our directions GREAT, but we noticed towards the end of the year and early January some things were being missed (ie. day-of photos being emailed, slates not being followed, etc.). It’s VERY important that the lead agent on each project reads our instructions CAREFULLY and makes sure talent understand them. In an ideal world there’s a uniform way we do things and we try not to change things much, but when we do it’s because someone above us requires the extra steps. PLEASE make sure all instructions are followed to a T! The above applies to all auditions and casting directors. I depend on you to relay all information to the person who is taping your audition. I do not have the time to make sure you followed directions since I work on numerous projects at the same time and each one has different directions to follow. Don’t give casting any reason to not submit you to producers. Do not wait until the last minute to send your audition. Casting views auditions as they come in and in my opinion it makes a big difference if your audition is seen at the beginning and not at the end when casting is overwhelmed with auditions. I made it through the entire month of writing in the diaries. 11 more months to go…wish me luck! It amazes me how much this business has changed in 25 years. Actors have not changed that much. The ones who are professional and talented get booked…the ones who phone it in, don’t. Strive to do the best at whatever you do. Auditioning is your job…booking is the icing on the cake! Plan to attend the “Rally In Tally 2015” and support Film Florida who is working for a tax incentive.